A 12-year-old boy was killed on a railway line in the Bedminster area of Bristol on Thursday. 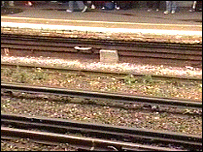 It is not yet known how the boy came to be on the track at Bedminster station at around 1700 BST. A British Transport Police spokesman said the youngster - who has not yet been named - was hit by a passenger train travelling to Temple Meads. "There are no suspicious circumstances to this incident," he said, asking witnesses to come forward. "The details of the deceased person are not being released at this time," he added. Wessex Trains operated the train involved in the collision. Spokesman Bob Houghton said: "This was a normal passenger train that left Penzance at 12.10pm to Bristol Temple Meads. "The train was delayed for an hour and a quarter at Bedminster station following an incident and then went on to complete its journey." Residents living near the track said they were "shocked" at the accident, but added that children were often seen hanging around the station, which backs on to a park. Catherine Sforza, 35, said: "I was really, really shocked. I've never heard of anything like this happen before. We have a six-year-old boy and it makes you think. Giles Chanot, 31, said: "Obviously some of the kids do consider the railway is something they can muck around with. "This is a terrible shock. It must be terrible for the boy's family."